OpenCV is an open source "computer vision" library, which means that it can be used to extract information from an image, or a series of images (like a video). A computer vision library has many uses, but my favorite is in the field of robotics. Eclipse was originally developed for the Java Programming Language, but using the Eclipse CDT it can be used for C++ development as well. Eclipse is cross platform, and has a huge following in both the open source and the corporate communities. I am not going to go into details about installing OpenCV, installing Eclipse, nor about installing the CDT which we will be using. There are other and better tutorials for doing that. 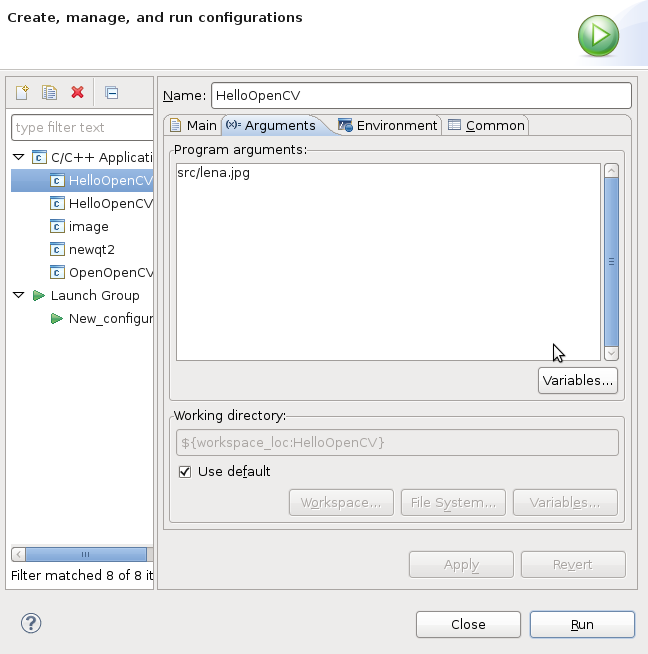 I will cover how to set up a simple OpenCV project in Eclipse, so that studiers can get writing code as soon as possible. *NOTE: If you are using an operating system with software repositories that include Eclipse, use the repository to install, as it will be much cleaner and easier. Enter the name of the project, and click next. Make sure you have "Executable" selected as your project type. Click Next again to see the Additional Project Settings page, and then click Finish. You will be asked if you want to open the C/C++ perspective. Click Yes. You should now be back at the main Eclipse window. Make sure that your new project is selected in the C/C++ Projects tab, and the go to Project->Properties. Select C/C++ Build from the menu at the far left, and then go to the Tool Settings tab, and select Directories under GCC C++ Compiler. On the right, add a new Include Path at /usr/include/opencv (or wherever you have the opencv include files installed). Now select Libraries under GCC C++ Linker. Add 'cv' and 'highgui' to the libraries, and add a library path to /usr/local/lib (or wherever your OpenCV library files are installed). To compile, simply save the project. If all went okay, you should have no errors. If you have errors, check to make sure that your include and library paths are correct. To run the program, you will have to set up a run configuration. Don't worry, this is easy. Just go to Run->Run.. and you will get the Run dialog. Double click C/C++ Local Application item on the left, and you should see your project appear under it. Select this project, and click the Browse button next to the C/C++ Application field. Select your project's executable. For the Image sample program to run, you will need an image file called 'lena.jpg' located in your project's src directory. You can copy this file from the OpenCV sample folder, or create your own. If you want to get fancy, you can re-edit your run configuration to use a file you pass in from the command line. Click Run to see your program execute.